"The period that begins now may prove to be the most exciting time for particle physics in this century." Well, I certainly hope not. I hope the century has a lot more and better to offer than the tired, dreary old intellectual fossils that have been wheeled out to "explain" the 750 GeV thing. I think the wild animals are trying too prevent us from getting to the bottom of the 750 GeV mystery. Don't be surprised if swallows start flying over CERN, carrying various objects (possibly collaborating in pairs to carry the heavier objects) that they will then drop on electrical equipment. I would start fearing brazilian butterflies too! @Alex Small: Arfican or European swallows? African swallows are non-migratory. So it would have to be two European swallows carrying it on some sort of line held under the dorsal guiding feathers. But do we know their airspeed? If this years becomes exciting, then the following years will be so as well. Reaching 2000 bunches will take some time, however. The SPS beam dump vacuum problem probably does not allow that at the moment, and even if gets fixed in time we need several days of good stable beams (= something like two actual weeks), and probably a few days of scrubbing. And then we run into the first machine development/technical stop break. ">If a hint of another resonance is seen at that point, one will surely be able to confirm or refute it with the data collected in the following years." Doesn't your community require the statistical significance for some deviation from the SM to be just as weak enough to be called "hint" (i.e. to rouse the media, to motivate 342 theory papers and 9 of your blog posts etc.) to expect a statistical fluctuation acting as a "hint" around about each year or so? That is how it worked in the last 15 years of operation of the Tevatron (with about just as many "Anomalies!") and that is probably how it's going to be the next 30+ years at the LHC. Right? If - due to a statistical fluctuation - no new "hint" will appear in the 2016 data set, will you personally draw the consequences u consider in the post? Or will you wait for 2017's hint? So what do you mean by the analogy between the SM and condensed matter? I saw it on other posts also. Are you leaning towards some type of technicolor? Or other compositeness? If any readers here once frequented the Physics Forums discussion board, they may wish to learn that Marcus, a long time moderator there and mentor to many physics students and interested laymen, died of a swiftly progressing cancer last week. @ Anonymous 14:54. Jester is joking that a career in high energy physics may be a dead end at that point so you may want to switch careers. Suppose that LHC does not find anything this and the next years. What could we do next, aside of condensed matter and astrophysics? I wonder, we have a nice 30 km tunnel, with great detectors, extremely powerful superconducting magnets, etc. Could we convert the whole setup to, say, electron-electron or electron-proton collisions in order to further explore the Higgs, the top mass, the interior of the proton, etc? I know that kinematics and synchotron radiation is a pain for electrons, but we would not need TeVs for this, just a bit more energy than old LEP. What say the experts? I say I don't get the joke. It's even possible that the joke may be on you. What's the betting landscape looking like? The consensus seems to be we're heading either for "who ordered that?" or crushing disappointment. SUSY just doesn't come into it in any obvious way, and everything else is exceedingly speculative, leaving those who seek clarity with a rather boring Bernoulli distribution to take our chances on. Are there gamblers out there who have been brave enough go beyond betting "heads" on the 750 GeV resonance, making it more interesting with qualifications, e.g. a new strong sector? My position from my desk is that there are basically two possible outcomes here. Either SUSY, string theory, etc, is pinned and the Planck scale and will only be accessible through condensed matter physics simulations, or there is a hierarchy of strong sector extensions running either through the lower TeV scale or even worse, all the way up through many orders of magnitude of energy to the Planck scale. In the former case gravitons, axions, dark matter etc were dragged down or rolled down to the TeV scale with inflation and the Higgs by the running vacuum, relaxion scenarios etc, and a synthesis of gravitational physics and quantum field theories is almost imminent. I'm currently leaning towards the gravitational synthesis because there is much more evidence for that in the current crop of condensed matter physics theories. Also, it just seems more exciting and is amenable to a lot cheaper laboratory investigations and will result is a great deal more exploitable new physics as well. > Could we convert the whole setup to, say, electron-electron or electron-proton collisions in order to further explore the Higgs, the top mass, the interior of the proton, etc? ee: Higgs with ee -> HZ would need 5% more energy, 20% more synchrotron radiation, and 20% higher accelerating gradients than LEP. Certainly possible, the XFEL/ILC cavities are a factor ~3 better than the LEP ones, so the accelerator would be limited by synchrotron radiation heat load. On the other hand, replacing the LHC with another circular ring would probably cost about as much as the ILC, which (a) can have a shorter timescale and (b) also gives access to top physics. ep: This is one of the options studied for physics after the HL-LHC. Those collisions would be very asymmetric, LHCb might be happy, I'm not sure about the other detectors. Radiation damage to them would be an issue as well. pp/ep/ee: The LHC could be used as preaccelerator for an 80-100 km ring ("FCC"), where all three modes would be interesting. The tunnel the LHC is in was originally digged for LEP, and LEP doesn't uncover Higgs, so building the LEP again wouldn't show as anything new. jester, so you do not expect anything (data/rumors) at LHCP next month? Anon 18:08, a bit too early even for rumors. Anons 16:53 and 14:09, the LEP-3 option (250 GeV e+e- collider in the LHC tunnel) is on the table. But I agree with mfb that it's probably not the most efficient use of the facility. Jester, much of your nihilism, false hopes, shattered hopes, trashing of other fields, could be easily resolved by accepting that the current theory industry is not working in a way that serves either physics or its employees. I am with Rastus and Maurice here. Also, I think it's the first time anything even slightly negative about your blog comes out of me! Finding just a standard model Higgs boson at the LHC and nothing else has always been the nightmare scenario. In that scenario we would not have any guidance how to proceed. 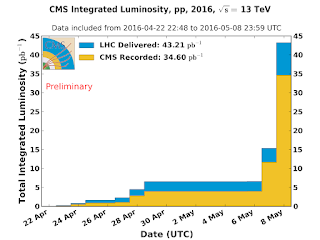 So I very much hope that we will find something beyond standard model at the LHC, and the 750 GeV diphoton excess is our best (and maybe only) hope for that. Tulpoid: Higgs discovery was immensely exciting for everyone involved, including HEP theorists. However there are concrete reasons for my angst. One is that it's now or never: if the LHC does not discover anything beyond the Higgs, the progress in understanding fundamental physics may be stalled for decades. Another one is egocentric: my generation also wants to contribute something new to theory, rather than just watching old predictions from the 60s being confirmed one after another. It think your pessimism is unnecessary because you are underestimating the power of modern condensed matter physics theory and experiment to provide guiding insights. I think this will be looked back at in a decade or two as our finest hour. Solid-state physicists also enjoy the opportunity to "bend" spacetime or taylor the "vacuum" where quasiparticles live, according to their will. At least they work hard to succeed in this quantum engineering, in order to create (or discover?) Majorana particles to give a fashionable example. But I think it is hard for them to extend spacetime while Young High Energy Physicists have the fascinating opportunity to explore conceptually and test experimentally new kind of dimensions with Nature-made or Man-made accelerators. Now the question is : should young high energy physicists be taught only as "transphysicists" exploring conjectured moduli spaces guessed from analogies and extrapolations (mostly to the benefit of mathematics up to now)? Or could they learn about recent mathematical progress in building new models of geometry based on axioms inspired by general relativity and the standard model ... and work hard to give flesh to the skeleton of what could be a real Glashow-snake. I don't know if you wish to publish my last comment but for the purpose of illustration I would like to give a counterexample to what I call "transphysics" because that might illustrate the zeitgeist some people feel as insiders or outsiders of the theoretical HEP community. well-established knowledge and just inch our way forward." I think that what 't Hooft says about black hole physics applies just as well for the Higgs mechanism. Off we go. ATLAS/CMS have 2/fb now, at an amazing rate of 0.2 to 0.3/fb the last days, machine development week got moved away and technical stop got shortened as much as possible. Chances are good we get multiple 1/fb for ICHEP. @10 May 2016 at 05:01: "It's a simple question of weight ratios! A five ounce [swallow] could not carry a one pound coconut."